N.C. 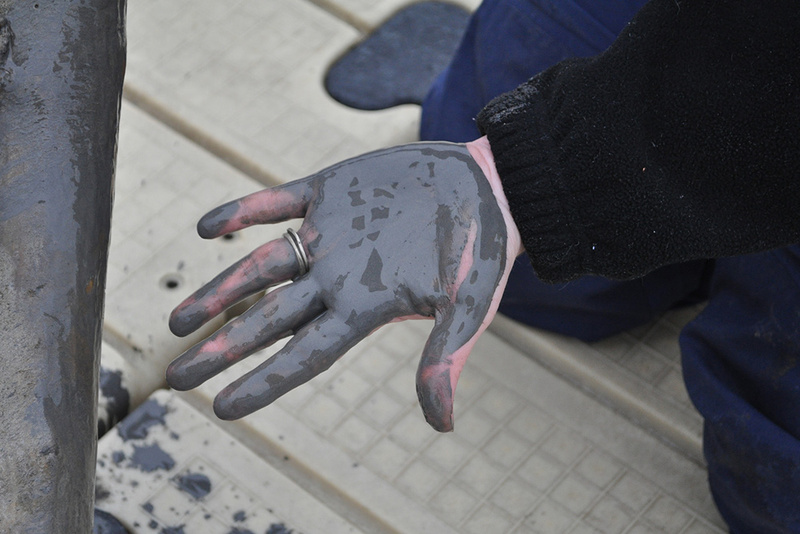 Program Manager Amy Adams checks on the amount of coal ash coating the Dan River following the 2014 spill. Long before the Dan River coal ash spill in February 2014 landed North Carolina on the national news, a crisis had been brewing in the state. It had been discovered that all 33 coal ash ponds located at 14 coal-fired power plant sites owned by Duke Energy throughout the state had been leaking. But it was not widely known by the public, least of all the people living near the power plants. The Dan River disaster forced the issue into the open. Over the course of several days, as much as 39,000 tons of coal ash and 27 million gallons of toxic wastewater poured into the river. But the political battle over how to address the state’s coal ash crisis has stretched on for years and continues today. At various points, Duke, state lawmakers, the governor and state agencies all dodged their responsibility to protect human health and the environment. Meanwhile, North Carolinians living near these coal ash sites or downstream have been caught in the middle. Within a month of the spill, the scope of the damage and causes of the disaster came into clearer view, as did the extent of the coal ash problem all across the state. The N.C. Department of Environmental Quality (then called the Department of Environment and Natural Resources) had been utterly remiss in inspecting the ash impoundments and enforcing pollution prevention measures. The spill triggered a U.S. Department of Justice criminal investigation into the agency’s relationship with Duke Energy. North Carolina lawmakers and Gov. Pat McCrory promised to enact a new state law to clean up coal ash sites, protect drinking water — and prevent anything like the Dan River spill from ever happening again. In August that year, the General Assembly passed the Coal Ash Management Act. The law prohibits new coal ash impoundments, regulates how ash is stored in existing impoundments, and sets timelines for impoundment closures based on the level of risk each site poses to groundwater. It requires total cleanup of just four sites. Although politicians touted the law’s passage, citizens who hoped representatives would keep their pledge were deeply disappointed. It was the first in a string of broken promises and subsequent moves by state leaders and Duke that betrayed the public’s trust. The new law also created the Coal Ash Management Commission to provide independent oversight of the coal ash crisis. For each site, the commission would be required to review water monitoring data, gather public comments and hold public hearings in nearby communities. But within months, it was evident that the commission would never be able to carry out its responsibilities. 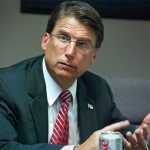 Rather than signing the Coal Ash Management Act, McCrory let the bill become law in September without his signature. Soon after, the governor — who had left his 29-year job at Duke a few years before taking office — sued the leaders of his own party in the legislature alleging that the makeup of the commission violated the separation of powers between branches of the state government. A 2015 decision for McCrory’s side led the governor to do away with the commission entirely, putting greater power for coal ash decision-making back in the hands of the DEQ. The move came as a shock to the public and to many legislators who didn’t trust the DEQ, which was still under federal investigation. 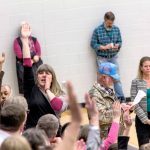 The fight to excavate and close the ten remaining coal ash sites would not be the first time citizens clashed with Duke, or with members of the McCrory administration that always seemed to take the utility’s side. In 2013, the agency had shielded Duke against citizen lawsuits seeking to hold the utility accountable for coal ash pollution; it was later revealed that DEQ staff coordinated with Duke lawyers before levying a fine of just $99,000 against the company. Within days of the Dan River spill, news reports started emerging of Duke’s troublesome ties to state regulators, and how new DEQ leadership under McCrory seemed loathe to stand up to the giant utility in defense of the public interest. The Justice Department’s investigation resulted in Duke pleading guilty in May 2016 to nine violations of the Clean Water Act and agreeing to a $102 million settlement, the largest federal crime fine in state history. Also that spring, the utility was testing the well water of citizens living near its coal ash ponds, as required by the new state law. Results showed elevated levels of coal-related contaminants such as arsenic, chromium and vanadium. The state health department issued warnings to more than 400 households not to use tap water for drinking, bathing or cooking. Without acknowledging any responsibility, Duke agreed to provide these citizens with bottled water — one gallon per person per day — but refused to provide filters or public water lines to the homes. Citizen groups and communities impacted by coal ash recognized the need to organize and stand together. In the summer of 2015, the Alliance of Carolinians Together (ACT) Against Coal Ash formed. 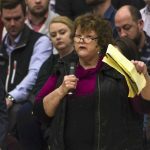 In spring 2016, when the DEQ announced final closure plans, residents’ fears were confirmed — the DEQ kicked the coal ash can down the road, again. While all of the ponds were initially ranked as either “high” or “intermediate” risk, the DEQ requested that the lawmakers revisit the Coal Ash Management Act in 18 months to alter closure timelines and the risk classifications in ways that could make the proposed rankings meaningless. As the legislative session came to a close that year, lawmakers passed House Bill 630, weakening the law and allowing Duke to leave most of its coal ash in place, ignoring the pollution of rivers, lakes and groundwater. And rather than re-establishing the Coal Ash Management Commission, lawmakers gave oversight responsibilities entirely to the DEQ. Gov. McCrory signed the bill in July as his campaign for re-election intensified. 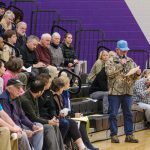 “Instead of protecting North Carolinians across the state, we get another sweetheart deal for Duke Energy to leave its ash in place where it will remain a threat to our community for decades to come,” David Hairston, who lives near the Belews Creek plant, said. McCrory’s successor, Roy Cooper, has pledged to restore credibility at the DEQ. The change in administration represents a new chapter in the fight to protect clean water and North Carolina communities from coal ash. 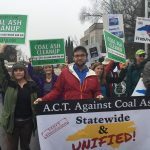 Appalachian Voices will continue its efforts, in partnership with impacted community members, to hold state leaders and Duke Energy accountable. We are calling for further testing of drinking water wells, groundwater and downstream drinking water supplies to better understand the extent of exposure of toxic ash to people and ensure that cleanup and closure plans are done right. We are also pressing Duke and the state to take a serious look at recycling coal ash for concrete and other uses, provided it is done in a way to protect public health and the environment. Using coal ash to make concrete physically changes the ash and holds the toxic elements, while also producing a valuable material. Concrete is typically made by mixing sand, rock and water with cement — a dry powder often made from burned limestone. Because of its chemical properties, coal ash can be substituted for cement when making concrete. Encapsulating the coal ash into a solid state minimizes the risk of contaminants leaching into the surrounding soil, water and air. The resulting concrete is also generally used for non-residential infrastructure projects, which further reduces risks to human health.